Three weeks changed everything for Kyle Ezell. City and Regional Planning Professor Kyle Ezell draws a diagram on a lightboard as he films a video lecture for his class on land development planning.After taking a workshop hosted by the Office of Distance Education and eLearning, Ezell completely revamped his course on land development planning for The Ohio State University’s City and Regional Planning program in the Knowlton School of Architecture. The class was intended to be traditional and in-person, but Ezell revised it to be more of a blending between online and in-person. 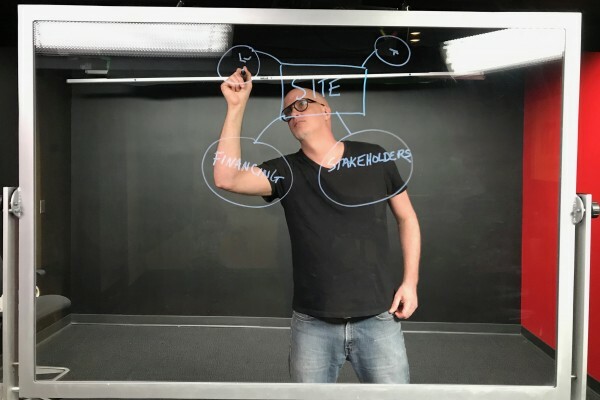 He’s “flipping the classroom,” delivering lectures and readings to students online asynchronously and using in-class time for activities and active learning. Online Course Delivery Basics, a workshop hosted by ODEE from October 22 through November 9, 2018, was aimed at helping instructors become better online teachers. The twist? It was offered fully—and solely—online in CarmenCanvas, the same platform those instructors must use to teach online Ohio State courses. This time, though, instructors were on the other side of the screen, and for many of them that was a completely new experience. Ezell’s first introduction to online education was the University Institute for Teaching and Learning’s Teaching@OhioState, which impressed him as an example of online, asynchronous—and effective—learning. He enjoyed it so much that he sought out other, similar opportunities, such as Online Course Delivery Basics. The three-week workshop focuses on learning theory to help instructors understand how to reach students. Participants were challenged to create a video welcome announcement for their course, which itself was a hurdle for some, including Ezell. Those interested in learning more can explore ODEE’s professional development workshops, such as Keys to Successful Online Teaching, scheduled for 9 a.m.-noon February 13, 2019.